Thanks to the vision and generosity of a local benefactor, the Parish History Society now has a permanent home in the Merchant's House. The Heritage Centre and tea rooms were originally a single building known as the merchants house. It is now a listed grade II property displaying many fine features. The moulded beams, elegeant plastered ceiling, timber panelling and fine stone fireplace probably date from the latter part of the16th century. The building on the left houses the Merchant's Tea Rooms and Tea Garden. 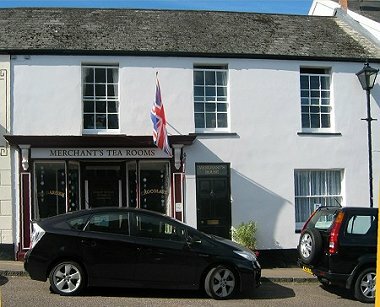 The Merchant's Tea rooms are an independant organisation located next to the Heritage Centre building. This remarkable medieval wall painting was discovered above the fireplace and is believed to be 16th century. The painting was restored in the latter half of the 20th century and a glass cover framed in oak provided protection.